The club has developed this site over the past 40 years, especially after buying the freehold in the 1980’s. Since then the club has excavated a swamp area into another lake, and suffered the occasional flooding into the lakes of the adjacent River Blackwater. 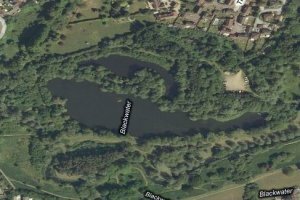 As well as a good head of carp, the main lake is known for its large tench, to which the club has added a further restocking of smaller fish recently. Roach, bream, rudd and perch are present, and also stocked stillwater chub. This is one of the Club’s main pike waters. Carp 28lbs, tench 10lbs, pike 15lbs, perch 3lbs, bream 6lbs. Lake perimeters flat and firm, short incline down from car park. This stretch skirts the freehold lakes, and contains dace, chub and roach, with a few bream, perch, pike and carp. Some distance from the car park, on the other side of the lakes. The banks are reasonable in winter, when the fishing is best. Is there disabled facilities , for fishing ?